Not too long ago, I had my first experience with dark chocolate covered coffee beans. After popping one of those delicious little nuggets in my mouth, I knew I wanted to try recreating them at home. I thought at first it might be hard because it seemed like there was a huge process involved in making them. Can I let you in on a little secret? They are not hard at all. 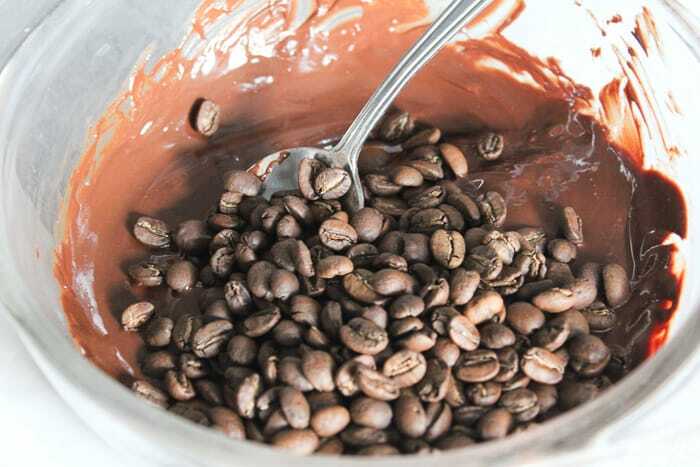 Two ingredients are all you need to make these delectable dark chocolate covered coffee beans. Homemade chocolate covered coffee beans are a great treat for you to enjoy by yourself or share with someone special. The dark chocolate flavour is the perfect sweet taste on the outside and pungent coffee flavour on the inside. This seriously makes the most amazing little snack! 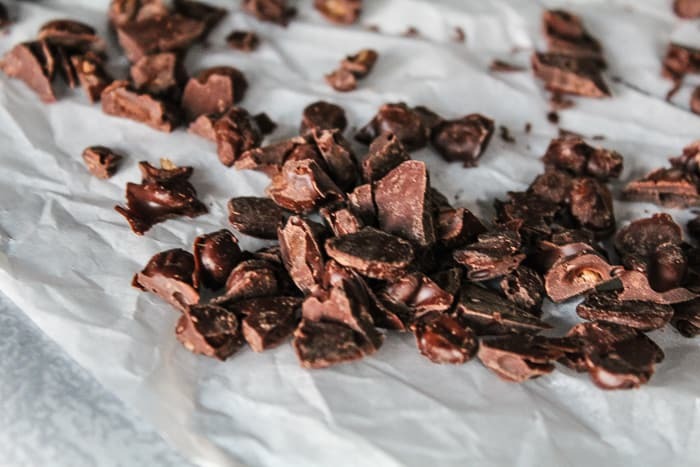 Melt the chocolate in a bain-marie or double boiler (which means using a saucepan placed above another pan filled with boiling water). Take a baking sheet covered in waxed paper and set aside. Once the chocolate is done melting, immerse your beans in the hot melted chocolate. 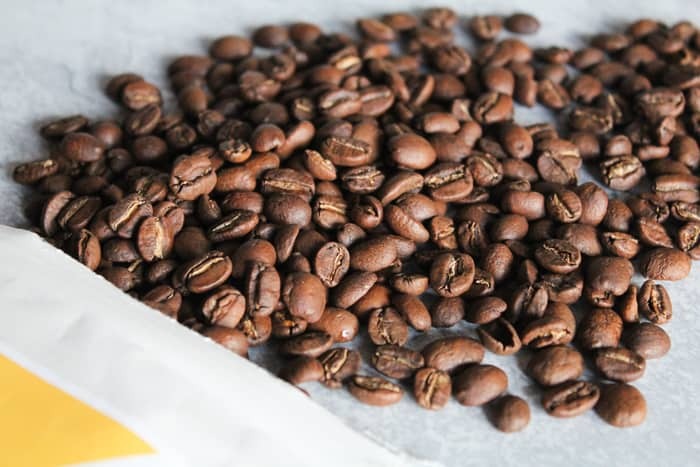 Put your coffee beans in the fridge for about 30 minutes (or until the frosting has completely hardened). Place in the fridge for another 30 minutes. Remove and repeat this process one more time. You should have a total of 3 dips in the chocolate. Let the chocolate covered coffee beans rest in the fridge for one night (or not less than 6/7 hours) before consumption, to make sure the chocolate frosting has properly hardened. That is really all it takes to make a delicious snack full of robust coffee flavour! What Beans are the Best to Use for Dark Chocolate Covered Coffee Beans? 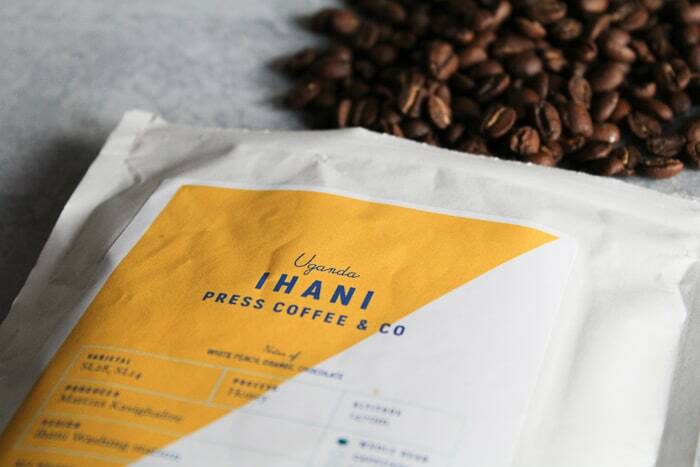 If you were like me and wondering what kind of coffee beans is the best choice to make these original sweets, no worries because we have a perfect choice! Let’s explore the different possibilities. When making chocolate covered coffee beans aim for a medium roast. Lighter roasts can taste acidic whereas the darker roasts can taste bitter. Aim for the middle. The coffees roasted and shared in the Blue Coffee Box Subscription box are all medium roasted and are perfect for this chocolatey snack! Coffee Arabica: Arabica is native to Ethiopia and it gives small and flattened beans. Despite their size, they’re very aromatic and fragrant. This is the most common varietal in specialty coffee and likely what you will use for this recipe. Coffee Liberica: Liberica is native to Liberia and it has big and well-shaped beans. It is not a prized variety, but it is well-suited for this preparation. Coffee Excelsa: Excelsa is a recent variety (it was only discovered in 1904) native of Northern Africa. Its beans have a medium size and their aroma is very similar to the Arabica ones so that they are the perfect choice for this recipe. Coffee Robusta: Robusta is native to Congo and its beans are round shaped and very rich in caffeine. For this reason, they are also very bitter, so they are not a good choice for this recipe. There are many recipes out there to make these, but with trial and error, we feel like this is the perfect recipe and offers the most flavour. 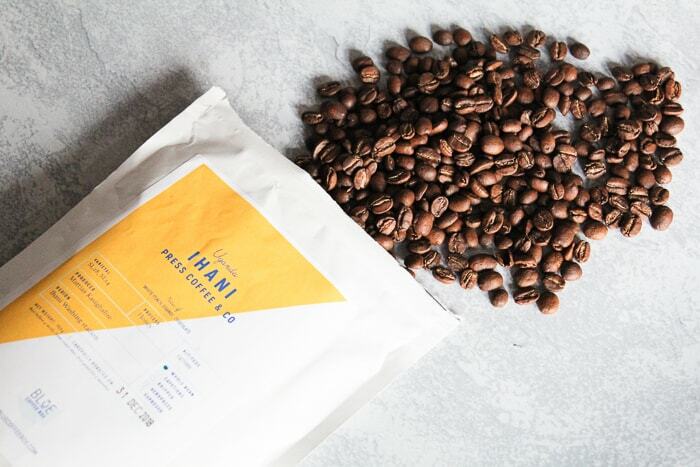 If you are on the fence about whether or not to get a Blue Coffee Box Subscription, this recipe should help you make that choice!